When you set up a Facebook page, there are two phases involved – preparation and actual set up. This article covers both. If you are looking for a step by step instruction on how to set up Facebook page, this article is not about that. There are many blogs written on that topic. In fact, THAT is the easy part. The questions in the infographic below serve as your guide and will also save you time setting up your Facebook page. When you read past the infographic, you will find more information on setting up your business page and about claiming your vanity URL which Facebook now calls as Facebook web address. That is what your page is anyway. It’s a mini-website hosted by Facebook. Now you have all the information you need to fill out your Facebook page, what’s next? Head over to Facebook and set up your business page. Optimize your Facebook content by using niche-related keywords for your business. READ carefully the Facebook vanity page instructions warning. Image cred: Facebook. I claimed a vanity URL recently for a page that has only one (!) follower. 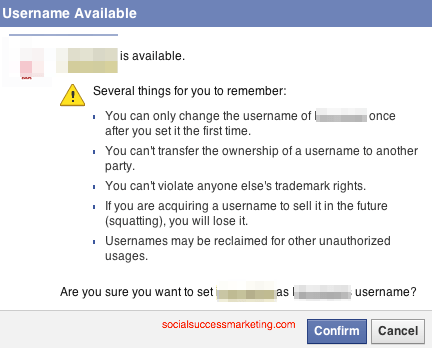 It appears that Facebook may have removed the number of profile “Likes” requirement. This could change…because it’s Facebook :D. Whether or not this is true for everyone, I am not sure. The best way to find out is to test it your self.